Talk about making a silk purse out of a sow’s ear, New Jewish Theatre has turned one of the less remarkable Neil Simon plays, “The Good Doctor,” into a highly entertaining evening. Based on Chekhov short stories, these eight little vignettes range from humorous to thought-provoking to missing the mark. But in the hands of director Bobby Miller and his wonderful cast, it all works out. 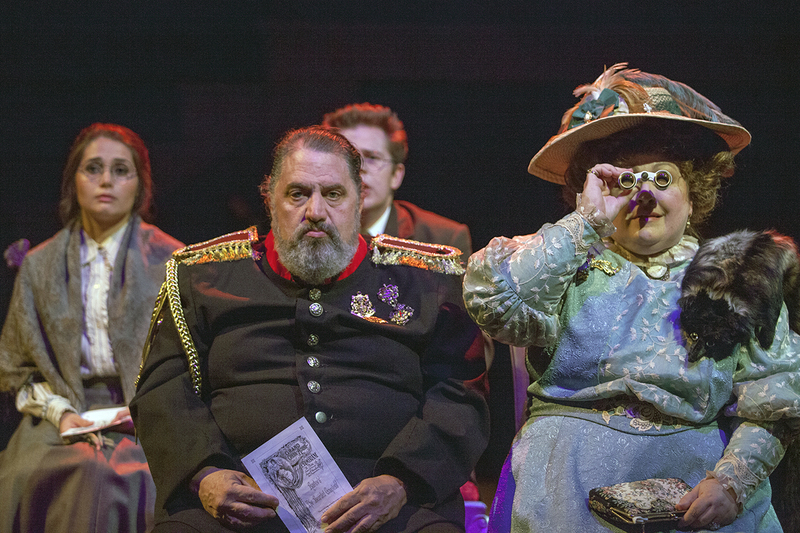 With Chekhov himself narrating and even participating in a few of the short plays, these unrelated stories are all tied together neatly and efficiently. With David Wassilak cutting a dashing figure as the playwright/author, “The Good Doctor” is off to a great start as he explains his method and means of writing these stories and then leading us into each little pastiche. 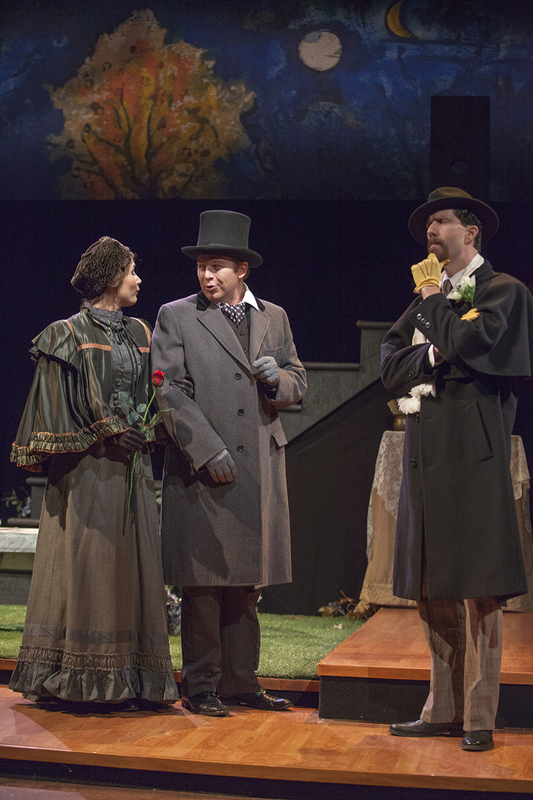 “The Sneeze” opens the evening with Aaron Orion Baker and Alina Volobuyeva as a husband and wife uncustomarily attending the theatre and, by chance, sitting behind his boss and his wife, played by Jason Grubbe and Teresa Doggett. An uncontrollable sneeze leads to the young man insinuating himself on his boss over and over again as he tries to apologize and reapologize for the despicable act. If it teaches us anything, it’s “leave well enough alone.” In “The Governess,” Ms. Doggett teaches Ms. Volobuyeva a thing or two about standing up for yourself. A silly Three Stooges take off in “Surgery” has Mr. Baker as a young dentist giving painful fits to Mr. Grubbe as his “first” patient. Rounding out the first act is probably the most successful and most clever story called “The Seduction.” We get a lesson from Mr. Wassilak as a well know Lothario who shows us how to seduce another man’s wife without even talking to her. Act Two then opens with a clever shell game played by Aaron Orion Baker on unsuspecting David Wassilak in an attempt to get paid for staging his own drowning. Things are left up to the audience’s imagination with the devastating final line. “The Audition” lets Alina Volobuyeva shine as all three sisters from Chekhov’s famous play as she almost unwillingly tries out for a part. “A Defenseless Creature” is just a hoot as Jason Grubbe as a gout-inflicted bank manager tries to deal with Teresa Doggett as an irate customer who ignores the fact that she is the one who doesn’t have a leg to stand on until she wears him down with her persistence. Closing out the evening is “The Arrangement” as father David Wassilak tries to arrange for Mr. Baker as the son to experience his first time with a young lady of the evening (Ms. Volobuyeva). As only Neil Simon, by way of Anton Chekhov, can handle it- things don’t go as planned and the indoctrination may have to be put on hold. Despite the obvious magic of both men (Chekhov and Simon) the usual modern stories that raise either uproarious humor of deep pathos from Simon don’t get a chance to come to fruition during these stories at the end of the 19th Century in Russia in “The Good Doctor.” There’s a spark here and there and the tales themselves are quite effective as short stories. But there are hits and misses when translated to the stage. Luckily, Bobby Miller and his group of fine actors wring every great moment from this script. They all get their chance to shine as well as play the straight man throughout these often quick-fire playlets. Add the wonderful set design of Dunsi Dai and the effective lights of Maureen Berry (although we do have occasional dark spots), and you’ve got an old world story that often still rings true today. The Michele Friedman Siler costumes are impressive and Bobby Miller has also provided the solid sound design. But huge kudos to David Wassilak, Alina Volobuyeva, Teresa Doggett, Aaron Orion Baker and Jason Grubbe for bringing these characters to life with honesty and sincerity. They make “The Good Doctor” rise above it’s mediocrity and reach the true potential that Doc Simon must have seen when he attempted this odd choice in his long and distinguished career. 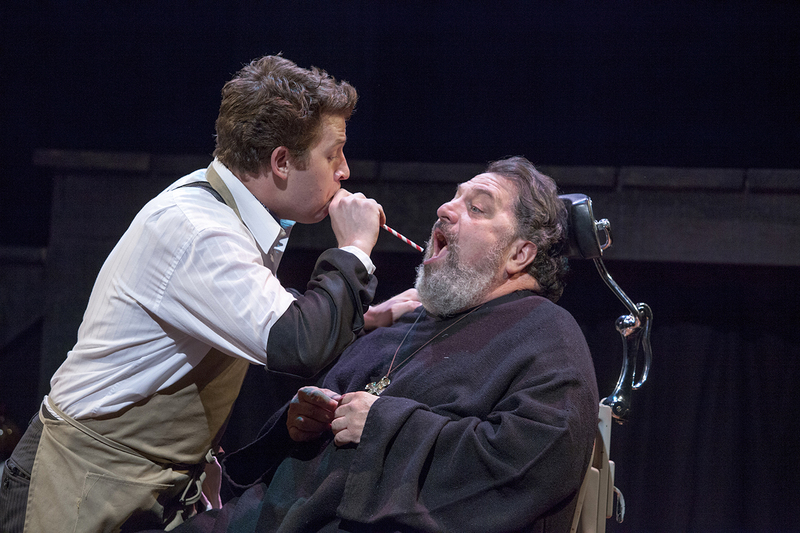 “The Good Doctor” plays at the New Jewish Theatre through October 20th. Give them a call at 314-442-3283 or visit newjewishtheatre.org for tickets or more information. This entry was posted on October 5, 2013 at 9:43 pm10 and is filed under Uncategorized. You can follow any responses to this entry through the RSS 2.0 feed. You can leave a response, or trackback from your own site.